This page describes some of my research activities and scientific instruments, most of which have been published in part in peer-reviewed journals of science. Click the Publications tab to see a list of papers. Total ozone measurements at Mauna Loa Observatory (MLO) using the original Microtops II instrument from Solar Light typically agreed with the station instruments to within 1 percent. This Microtops II was placed in service in 1996, and its algorithm has not been changed from the original (based on a comparison at MLO with world standard Dobson 83). Agreement with the OMI instrument aboard the Aura satellite is excellent. Sun photometer Langley calibrations yield excellent results at MLO, with correlations (r2) of the natural log of the signal to the air mass generally exceeding 0.999. Repeatability of the extrapolated extraterrestrial constants over 4 usable days of calibration for the blue, green and red channels of the first instrument to be analyzed was within 1-2 percent during the 2005 session. Cuiaba (1995): Measurements of total ozone, solar UV-B, column water vapor and optical thickness for Goddard Space Flight Center (NASA) during the SCAR-B campaign. This research conducted for NASA's Goddard Space Flight Center (Purchase Order No. S-59036-Z, 1995). Alta Floresta (1997): Measurements of total ozone, solar UV-B, column water vapor, optical thickness, photosynthetic radiation, airborne bacteria and plant growth at Alta Foresta and the Cristalino River for the University of Sao Paulo and Goddard Space Flight Center. The photo by Brad White shows Forrest Mims measuring optical depth from a hill on the Cristalino River. This research conducted for NASA's Goddard Space Flight Center (Purcahse Order No. S-97728-Z, 1997). Forrest Mims studies smoke at Brazil's Cristalino River. Photo by Brad White. The shadowband radiometer was installed on this tower until it was moved to Texas Lutheran University in 2004. 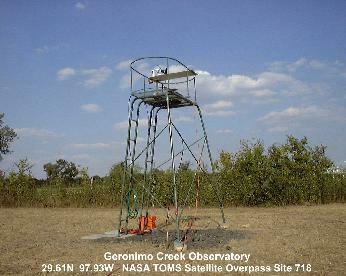 Geronimo Creek Observatory is an open field near Geronimo Creek in South-Central Texas from where the ozone layer, UV-B, haze and the water vapor layer have been observed on a regular basis since 1990. A Solar Light 501 Biometer has monitored solar UV-B each minute since 1996. A Yankee shadowband scanning radiometer has measured 7 wavelengths of sunlight each minute since 1998. This instrument was moved to Texas Lutheran University, Seguin, Texas, in March 2004 to be adjacent to site TX31 of the United States Department of Agriculture UV-B Monitoring and Research Network (http://uvb.nrel.colostate.edu/UVB/uvb_climate_network.html). This will provide an important intercomparison opportunity for the Geronimo Creek instrument and the USDA instrument suite. Annual calibrations since 1992 of total ozone instruments (TOPS and Microtops) and Langley calibrations of many Sun photometers and near-infrared hygrometers. Many Sun photometers have been calibrated for student programs to measure haze, UV and water vapor. This work has been conducted for the GLOBE program, the Goddard Space Flight Center and the Langley Research Center in association with Dr. David Brooks of Drexel University and with the assistance of University of the Nations. 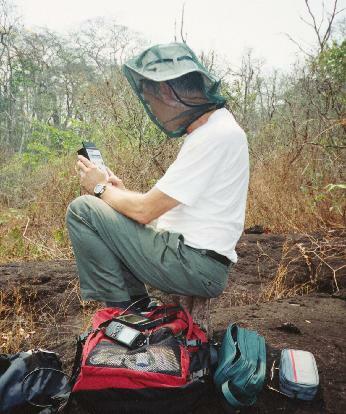 The photo shows the Yankee Shadowband LED Radiometer from Geronimo Creek Observatory being calibrated adjacent to USDA instruments at the Mauna Loa Observatory. This is the only such instrument that employs LEDs as detectors for each of its seven optical channels. The long-term stability of some of these detectors will be described in a future paper.. 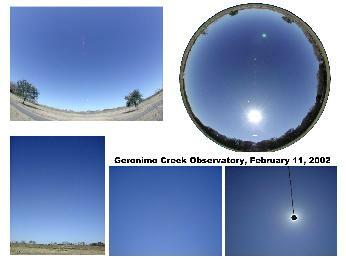 Solar aureole and zenith photographs at Geronimo Creek Observatory since 1998. Full sky (fisheye) photographs of the zenith sky and the north horizon since 2000. These photographs are generally made at or near local solar noon. They provide important information about the presence of clouds, dust, smoke, sulfate pollution an even pollen in the atmosphere. As of November 2013, more than 20,000 digital photos have been acquired during this program. Sun and sky digital images. 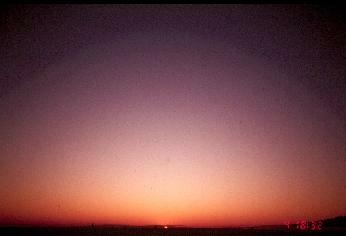 The progression of the colors of the sky before sunrise and sunset and during twilight provide important clues about the presence of aerosols in both the troposphere and the stratosphere. Before the satellite era, twilight studies were one of the few methods scientists could use to study the upper atmosphere. Such studies still have merit. Forrest Mims has collected a few thousand Kodachrome and digital images of twilights since the 1991 eruption of Mount Pinatubo, which caused stunningly brilliant twilights for several years. He has also photographed colorful twilights caused by Tropical Stratospheric Reservoir (TSR) events, one of which he discovered and published a paper about. Twilight glow in Texas caused by the volcanic eruption of Mount Pinatubo. Copyright by Forrest M. Mims III. The stratosphere is the very clean, dry region of the atmosphere that overlies the troposphere. Some 90 percent of the ozone layer is found in the stratosphere. The tropopause is the boundary that separates the troposphere from the stratosphere. Depending on the latitude, the tropopause is at an altitude of from around 8 km (near the Poles) to 14 kilometers (near the Equator). Aerosols injected into the stratosphere by Plinian volcano eruptions and possibly major fires can cause very colorful, extended twilight glows. Aden and Marjorie Meinel have given a very simple method for estimating the altitude of the aerosol layers that cause extended twilights. The method is described in "Sunsets, Twilights & Evening Skies" (Cambridge University Press,1983), a fine book which belongs on every sky watcher�s bookshelf. The chart at left plots the height of stratospheric aerosol layers as a function of one's location (latitude) and the duration of the time from sunset to the setting of the top of the twilight arc. The chart is from a simple Lotus 1-2-3 spreadsheet available here as an Excel file. Height of stratospheric aerosol layers that cause extended twilights (chart based on the Meinel method). The plots at right are typical of those I have obtained from measurements of the twilight glow when no clouds are at the zenith and the sky is very clear. The straight line in the second panel was inserted to illustrate the deflection in the data caused by the ever-present layer of aerosols in the stratosphere. This layer usually begins at or near the tropopause (typically 15-16 km at my Texas site) and may extend to around 25 to 50 km. During summer 2013 I detected various layers of Saharan dust and air pollution. Most twilight profile studies display the derivative of the data to emphasize changes caused by aerosol layers. Each of my twilight studies from June 2013 to the present include such plots, examples of which will be posted after work has been completed on a new paper. I also want to do more measurements to better understand the effects of urban light pollution and moon light. So far these effects seem to provide a background threshold that does not appreciably alter the detection of aerosol layers. Snow provides a natural mechanism for collecting fungi, protozoa, rotifers and many kinds of atmospheric particulate matter. The images at right show snow from near the National Solar Observatory in the Sacramento Mountains of Southern New Mexico on 27 March 2004. The snow was covered by a layer of mineral dust and microscopic gypsum crystals during a major dust storm on 19 February 2004. During March 2004, smoke from large scale agricultural burning in Southeast Asia covered much of the Western United States. Microscopic flakes and clusters of carbon in the snow probably arrived from this source. Local smoke is ruled out by the very low concentration of carbon particles in the snow below the contaminated layer. The gypsum crystals are obvious by their rhomboid shape. The deposits on the snow included fungal spores and protozoa. The latter are evident in the snow melt as moving objects measuring only 5-10 micrometers. The microscope images at right (1,000X) show carbon, mineral particles, very small gypsum crystals, and at least four genuses of fungi. Snow overlain by soil, gypsum, carbon and fungi. The following projects have been conducted in whole or in part. Some have been described in peer-reviewed papers. Details will be posted here when time permits. Long-term measurements (1996 to date) of photosynthetic radiation (PAR) at Geronimo Creek Observatory. Airborne bacteria population changes associated with UV suppressed by biomass smoke in Brazil. Association of photosynthetic response of plants with spectral markers in sunlight. Spectroscopic measurements of skylight, direct sunlight, plants, lichens and soil using optical fiber spectrometers (direct, transmission and reflectance spectroscopy as appropriate). Photosynthetic response of simulated leaves installed at various positions on a tree. Subcanopy sunlight measurements under clear and hazy skies. Tannin deposition in trunks and branches of baldcypress (Taxodium distichum). Vertical fisheye images of tree canopies viewed from the forest floor.. Expanded range of Chorioactis geaster, a spectacular and rare fungi found only in Kyushu, Japan, and at several Texas sites (including Geronimo Creek Observatory). Investigations of protozoa in alpine snow. Studies of viable fungal spores and bacteria in smoke from biomass burning. Female mosquito collecting blood. Copyright by Forrest M. Mims III. This page describes only instruments that have been described in peer-reviewed journals of science. Click here to see a list of papers. Click on thumbnail images to enlarge them. Click here for copyright and permission statement. At least six instruments for measuring total ozone, UV-B, photosynthetic radiation (PAR), optical depth and column water vapor will be eventually described on this page. TOPS is a miniature, handheld instrument that measures the total thickness of the ozone layer to within 1% of the amount measured by NASA ozone satellites. A Scientific American article (F. M. Mims III, How to Monitor Ultraviolet Radiation from the Sun, vol. 263, pp.106-109, August 1990) described a radiometer for measuring the intensity of ultraviolet sunlight at 300 nm in the UV-B. Because ozone absorbs shorter wavelengths of UV more than longer ones, TOPS was designed by placing two UV-B radiometers in the same enclosure. One measures UV-B at 300 nm and the other at 305 nm. TOPS was calibrated against the Total Ozone mapping Spectrometer (TOMS) on NASA�s Nimbus-7 satellite. In 1992, TOPS found an error of a few percent in TOMS ozone measurements, a finding that was published in a leading scientific journal (F. M. Mims III, Satellite Monitoring Error, Nature 361, 505, 1993). TOPS also measured waves in the ozone layer during a total eclipse of the Sun, a finding also published in a leading journal (F. M. Mims III, and E. R. Mims, Fluctuations in Column Ozone During the Total Solar Eclipse of July 11, 1991, Geophysical Research Letters 20, 367-370, 1993). TOPS measures the ozone layer to within 1% of NASA satellite and ground-based Dobson and Brewer measurements. Complete construction details for TOPS were published in Science Probe! magazine (November 1992). This article was reprinted online, along with updated comments and notes, in The Citizen Scientist (TOPS, a Hand-Held Instrument that Measures the Ozone Layer, 2 February 2007). A PDF of the original article in Science Probe! (5.1 MB) can be downloaded here. Successful assembly of TOPS requires the use of high-quality ultraviolet filters along with photodiodes that do not respond to the near-infrared that passes through most such filters. This topic is addressed in the article. While the TOPS article was not published in a peer-reviewed journal, findings made using TOPS were published in several such publications. Please see above or visit the Publications page. Complete construction details for TOPS were given in Science Probe! magazine (November 1992). 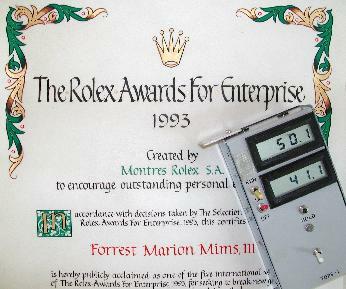 A plan to measure ozone around the world led to a 1993 Rolex Award. The award was accompanied by 50,000 Swiss francs, which was entirely devoted to designing and building a microprocessor version of TOPS (Microtops) and a family of simple solar irradiance instruments. Forrest Mims designed and constructed the radiometers and specified and selected the wavelengths for Microtops. Scott Hagerup designed the Microtops hardware, wrote the code, and built the first prototypes. Some 30 Microtops were built and used in various studies in Togo, Brazil, Paraguay, Falkland Islands, Hawaii, Colorado, Texas and elsewhere. The Rolex Microtops led to the development of a more sophisticated instrument called Microtops II by Solar Light, Inc. 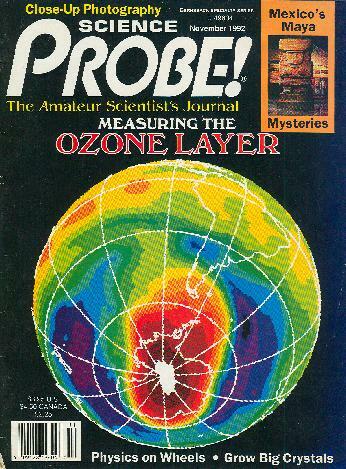 The original version of Microtops II measures the total ozone and water vapor in a column through the atmosphere and the atmosphere's aerosol optical depth (haze). A second version is a Sun photometer that measure optical depth at five wavelengths of light. Both instruments are designed for spot measurements rather than continuous monitoring. More than 100 Microtops II are in use by scientists around the world. Simple 2-channel radiometer with multiple gain settings and interchangeable probes that respond to full sky (global) solar irradiance at various wavelengths. Two kinds of probes are used, filter and light-emitting diodes. Filter probes designed to detect visible and near-infrared wavelengths use silicon photodiodes. Filter probes designed to detect ultraviolet wavelengths use solar blind gallium phosphide photodiodes. LED probes do not use interference filters. They have much better long term stability than probes using filters, but they are more temperature sensitive and their spectral bandpass is wider. Both kinds of probes are fitted with Teflon diffusers that provide good cosine response. This is the interior view of my first dedicated twilight photometer. The instrument employs one of several near-IR detectors, usually an 880-nm AlGaAs LED connected as a detector instead of an emitter (not shown). 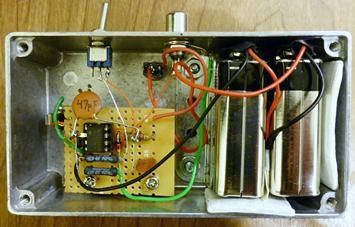 The amplifier is an opamp operated in the transimpedance mode with a very high gain provided by two 40 gigohm feedback resistors. A switch allows one to be selected (gain = 40 x 10^9) or both to be connected in parallel (gain = 20 x 10^9). Twilight photometry is an old method employed to detect and measure the elevation of aerosol layers in the sky. The method relies on the sweeping of the solar beam across the sky during the 45 minutes or so before sunrise and after sunset. 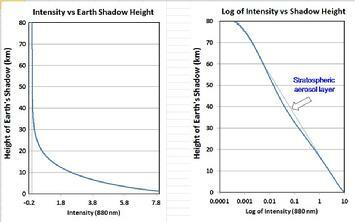 Aerosols below the earth's shadow have much less of an impact on the brightness of the twilight at the zenith than do aerosols just above earth's shadow. Among the early practitioners of this method was E.K. Bigg (see "Atmospheric stratification revealed by twilight scattering" Tellus XVI, 1964, 76-83). Others include G.M. Shah, D.N. Nighut, F. Volz and B. Padma Kumari. Complete construction details for this instrument will be published in my column in MAKE Magazine during 2014.